Family means different things to different people, based in no small part on their childhood experiences. Being raised by someone other than birth parents can have a dramatic effect on how a person turns out and how they relate to the world. Often, those who have been adopted seek to reconnect with those who were not, for whatever reason, able to provide a home for them when they were young. That reunion, if actualized, can have important implications on how someone comes to understand the factors that have shaped them into who they are. 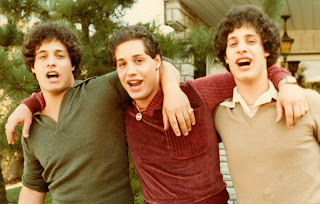 The story that serves as the catalyst for this documentary is truly incredible: Bobby Shafran started at a community college at age nineteen and, upon being recognized by every person he passed, discovered that he had an identical twin brother, Eddy Galland. Once they went public with having found each other, a third young woman with the same face, David Kellman, confirmed that they were triplets. As they bonded and revelled in their similarities, they learned a much more disturbing truth about their separation that led to them being adopted without any knowledge of each other’s existence. This film begins as a wondrous celebration of this miraculous coincidental union, with understandable excitement from magazines and news programs at the times. As the brothers move in together and start a restaurant, deeper issues are revealed, including a history of depression experienced by all three. Simultaneous research unveils that the three were deliberately split and monitored to conduct a study on how those who share the same DNA would develop and behave in isolation from each other. This film breaks down the actions and apparent motivations for a practice compared by the brothers to Nazi experiments, trying to understand how anyone could justify this separation. 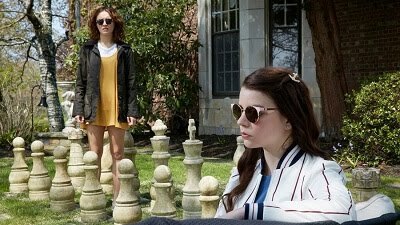 This film, which covers one fantastical sequence of events and the far more troubling history that helped to create it, changes its tone dramatically as it delves into its story. Both its introductory excitement and its more devastating serious revelations are equally compelling, and featuring interviews with the brothers, through archive footage and in much more recent conversations, is the film’s strongest selling point, since seeing these brothers act in almost the same way despite never having known each other is truly mesmerizing. This documentary is truly terrific, a completely captivating look at this unbelievable situation which still has those involved struggling to find answers.